(1) Comfortable on the Coastal Ledge: Views of the Atlantic influenced every aspect of the design of this 2,500-square-foot home perched on top of a large ledge outcropping overlooking a small bay in Biddeford. Caleb Johnson Architects and Builders designed the home with a gracious entryway facing the quaint neighborhood of Granite Point. Dramatic yet intimate decks flow out from the kitchen and living room to take in the sweeping views. The house sits squarely and comfortably on the coastal ledge, with low roofs surrounding the main gable. Coastal regulations played a heavy role in shaping and siting the building, but were used as advantages to add interest to the design. Caleb Johnson Architects and Builders designed the layout of the house to be kept informal, emphasizing an openness between the living room, kitchen, and decks. (2) Historic Townhouse, Respectfully Renewed: The western residence of the Samuel Trask Block is a remarkably intact single-family townhouse in Portland’s Western Promenade Historic District. In a prominent corner location, all three sides of the property are highly visible, including the backyard. Before renovation, it had a high, solid board fence, a sunken garden, and no direct entry to the kitchen at the back of the house. The back of the property did not come close to the beauty of the meticulously restored and maintained front and side. A renovation by architect Carol De Tine of Carriage House Studio included the addition of a porch and mudroom, filling in a sunken garden to bring the grade closer to the first-floor level, a new, level parking area, and new lattice fencing. Because the backyard is so prominent in the neighborhood, the homeowners wanted it to be more open and attractive when viewed from the public way. Rather than copying exactly the existing details of the house, De Tine simplified them while maintaining the grand scale of the original house. The new construction is distinct from the original: The exterior walls of the original house are brick; the new mudroom/entry is constructed of painted wood siding so that it reads as part of the new porch. The front porch has fluted columns on pedestals; the new back porch has unfluted, full-height columns. The front porch has turned balusters; the new porch has solid framed panels. 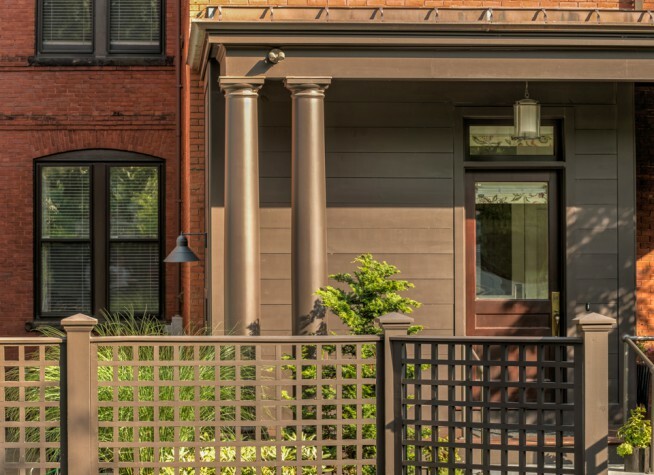 The front porch has bronze railings with intricate posts and ball finials; new railings consist of powder-coated steel pipes and spheres. The project received a 2014 Preservation Award from Greater Portland Landmarks. (3) A Contemporary Hotel at Home in a Historic Downtown: The new Hyatt Place in downtown Portland is a seven-story, 80,000-square-foot contemporary hotel. 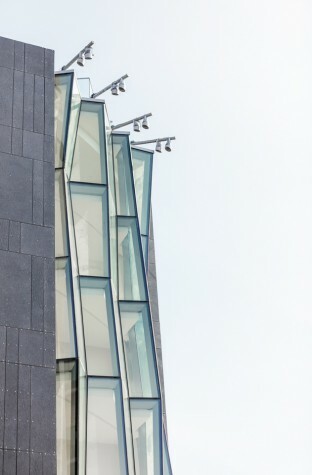 Inspired by pleated curtains and folded paper, architectural firm Canal 5 Studio designed a distinctive glass “crinkle wall” on the corner of the building that weaves around the structural columns on the ground level and, on reaching the corner, ascends unrestrained. The wall not only creates transparency along the public way, but it engages the public spaces of the hotel with the Old Port’s vibrant street scene. A rain-screen system that sheathes the building is made of composite stone panels, color-matched to a particular piece of slate from a quarry in Monson. To minimize site and traffic disruption and accelerate the construction schedule, the hotel was constructed via modular panel construction; the exterior envelope was built off-site in a warehouse and delivered sequentially. Canal 5 Studio designed the building’s panels and window openings in a complex pattern to provide a lively and variegated façade. They also worked with local artists to create custom light fixtures inspired by kelp in the lobby bar. Environmental design choices include a natural-gas 10-kilowatt micro-turbine that provides electricity and generates domestic hot water from the excess heat of combustion, and low-flow plumbing fixtures and LED lighting. (4) Modest, Efficient & Cost-Conscious: This house started with a conversation over pizza. How could architect David Johnson’s brother-in-law and his young family find a home in their price range that wasn’t in desperate need of repair and was compelling architecturally, energy-efficient, and flexible so their growing family could expand as needed? This turned into “How do people live in houses today? 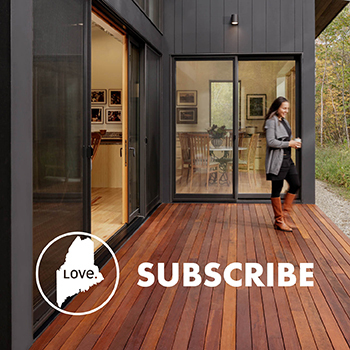 How can we build a modest, efficient home cost-effectively?” Then they found a beautiful piece of property on a high point of land in Penobscot with 360-degree mountain and pond views. Further conversations resulted in a modest 20- by 50-foot form that could be framed quickly and respond to the gentle slope of the hilltop terrain. The design developed into the “One K House,” referring to the 1,000-square-foot original footprint. The living functions—kitchen, dining, and living room—all occupy one common space, focusing on the sun and views. This space has maximum solar exposure and offers views to the mountains from Camden to Acadia, with Blue Hill due south. The passive solar gain afforded by this glazing and orientation effectively meets much of the home’s heating requirements. Bedrooms and bathrooms are tucked back off the primary views and have smaller, episodic windows. The home’s envelope is built with structural insulated panels (SIPs), limiting the thermal bridging common to stick-framed homes and providing high insulation values. The SIP construction also allowed the homeowner to expedite construction, once the slab-on-grade foundation/floor was in place. Installed over several inches of rigid insulation, the concrete floor provides a thermal battery that helps warm the house from dusk to dawn. During initial construction the unfinished shell saw outdoor temperatures in the single digits for three consecutive days, and the interior air stayed in the mid-40s or better without mechanical assistance. (5) A Restaurant Takes its Cues from a Lumber Town: Architect Robert Ervin’s design of Blaze, a farm- to-table restaurant featuring craft beer and wood-fired cuisine, was inspired by Bangor itself. The architecture took its cues from the industrial lumber town and was complemented by reinterpretations of local building products, updated finishes, reclaimed materials, elegant lighting, and a refined atmosphere. Situated on the first floor of the Webster Treat block—a six-bay brick structure built in the Italianate style in 1869—the building was covered in over a century of patchwork construction that took nearly six months to remove and repair. The original wood timber framing, peach and apricot load-bearing brick walls, and historic tin ceilings were saved. The design took inspiration from these elements but pushed to expand and harmonize notions of tradition and common history with contemporary design. The restaurant relies on two brick ovens thatwere built using reclaimed brick found in the fireplace foundation of a turn-of-the-centuryfarmhouse in Holden. The flooring consists of widepine boards that were face-nailed with antique cut nails. Suspended acoustic ceiling tiles resembling the original Wellington pattern were used. Maine Heritage Timber supplied era-appropriate reclaimed timber from the bottom of Quakish Lake, on a tributary of the Penobscot River. Reclaimed river wood was also used to create a live-edge bar display. 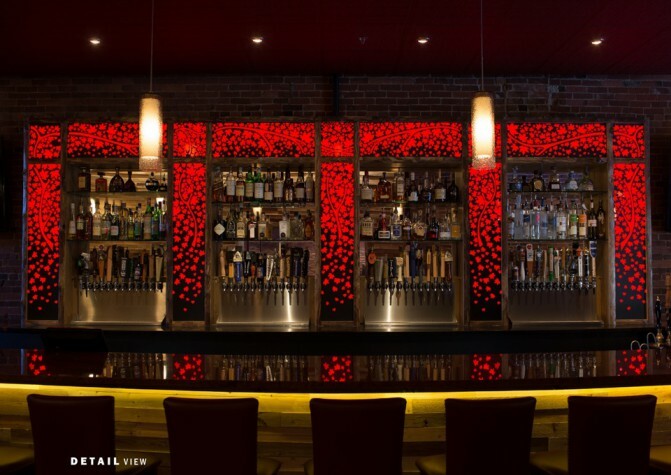 The patterned panels in the bar display were made using a series of custom LED-illuminated stencils with themed branches that link the panels and sprinkle the bar area with shimmering, confetti-like leaves. (6) A Union of Wood and Stone: Down a narrow path, beyond a swing hanging from an oak among ledge outcroppings, the original cottage in Edgecomb sat under the trees on a point of land. The structurally sagging home was built with low eaves that obstructed views to the surrounding rivers. The clients wanted to reconnect the home to its rocky coast-bound woodland environment while also adding space for extended family and guests. The cottage was located in a 75-foot shoreland setback, confining the possibilities for expansion. Architect Sue Mendleson and her team at Knickerbocker Group came up with a solution that involved two modestly sized homes: a family cottage and a bunkhouse just beyond the setback, to be built in series to minimize the impact on the land. The open plan in the family cottage was designed around a massive stone element in its center: large slabs of rough-cut granite backdrop the kitchen workspaces, a sweeping stone arch graces the fireplace with its oversized drilled-and- split hearth, and a loft ladder conforms to the shape of the stone. Wood—Douglas fir beams, reclaimed ceiling boards, antique oak floors—meets stone in clean contoured lines. In the treehouse-style loft with gabled walls made entirely of glass, the materials are echoed in long views of woods, rocks, and water. The bunkhouse is eclectic: a modern-day bungalow with colorful tiled carpet, salvaged leaded-glass-window art, colorful painted trim, knotty pine ceilings, and birch tree accents. The homes are unified by a central stone patio and fire pit, characterized by handmade found-wood Adirondack chairs and a grill/cooking station crafted of granite. Today, the same narrow woodland path leads you to the new cottages. Tucked among the trees, they subtly echo the natural materials in the environment around them. Both inside and out, the union of wood and stone evokes a reconnection to place, a reminder of the elemental nature of Maine. (7) Off-the-Grid Capabilities, on-the-Mark Durability: Architects Chris Briley and Harry Hepburn of Briburn were approached to create a small, affordable, one- or two-person home on Dragonfly Pond in Parsonsfield that has the ability to go off the grid. This meant that the home had to be highly durable, resilient, and energy-efficient—even net-zero (able to produce as much energy as it consumes). 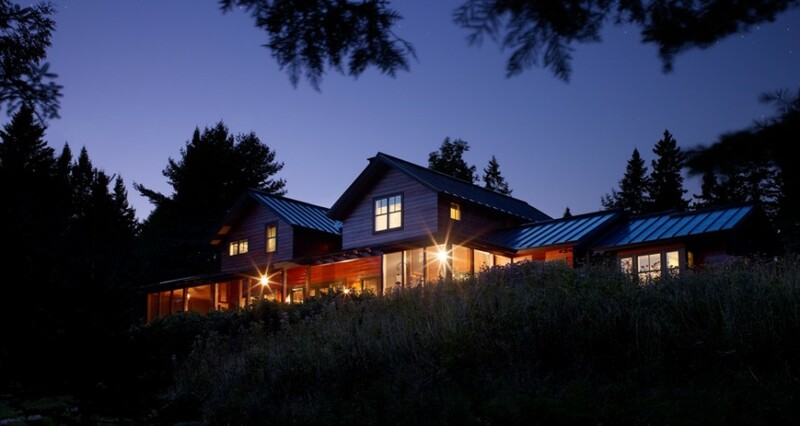 Briburn achieved this by taking advantage of passive solar design principles, superinsulating the home with a vapor-open, truss-stud construction method, and by using highly efficient European triple-pane windows. With the energy demand reduced, the mechanical system could be downsized to a single, affordable ductless mini-split heat-pump system. The home also features an attached greenhouse for year-round gardening. 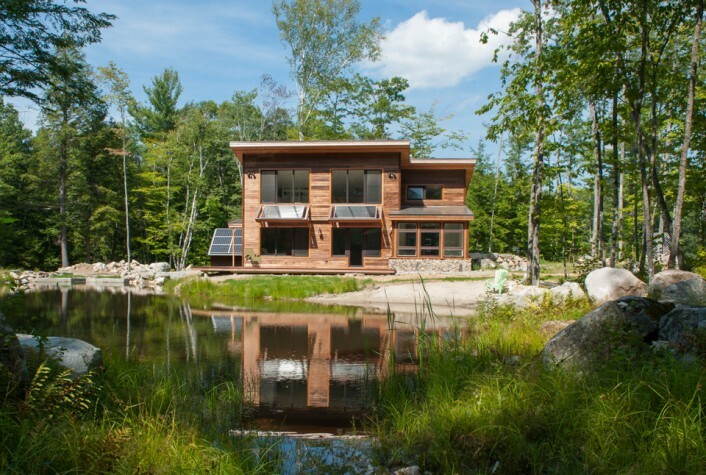 The home is located on a new upland pond that is permitted for micro-hydro electrical production. A solar shed houses the battery array, meter, and inverter. In the near future, a covered bridge will be built that will support an even larger solar array. The sunshades over the ample southern windows are themselves solar hot-water panels. The home is small, with an extremely simple, open interior detailed with stained concrete floors, deep windowsills and jambs, and hand- painted cabinets. On the exterior, the home is clad with thermally modified local poplar, Douglas fir trim elements, metal roof, and masonry that was completed by the homeowners using stone salvaged from the property. Within a tight budget, every design decision had to take into account its long- and short-term economic effect while not sacrificing energy efficiency and construction quality. (8) Gambrel Inspiration, Contemporary Technology: After more than 20 years of planning, builder Eric Smith of Oceanside Builders, together with his wife, Laurie, and their three children, now live in a new home built on a tract of land that has been a part of his family for generations. Smith enlisted the help of his friend and summer neighbor, architect Robert S. MacNeille of Carpenter and MacNeille, whose family has been on Bailey Island for the past century. A century ago, MacNeille’s grandfather (architect Perry R. MacNeille of New York firm Mann and MacNeille) designed Bailey Island’s Library Hall, a local colonial revival landmark that strongly references architectural elements of George Washington’s Mount Vernon and is now listed on the National Register of Historic Places. 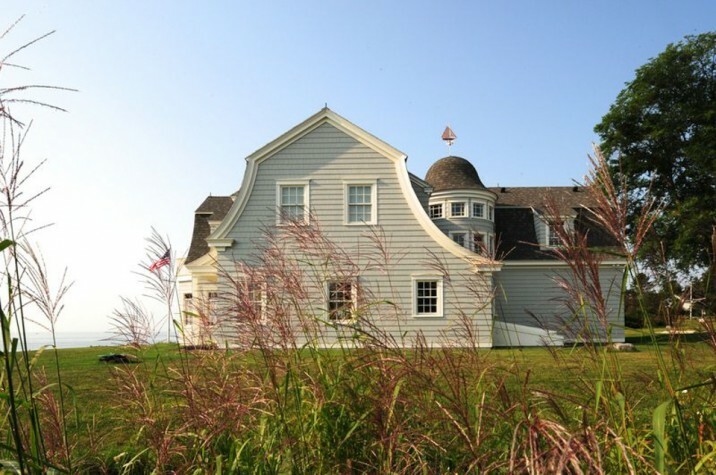 Drawing on the rich architectural history of coastal Maine, MacNeille ensured that Oceanside, though completely new, would draw its primary design inspiration from the prevalent gambrel shingled cottages of the region. 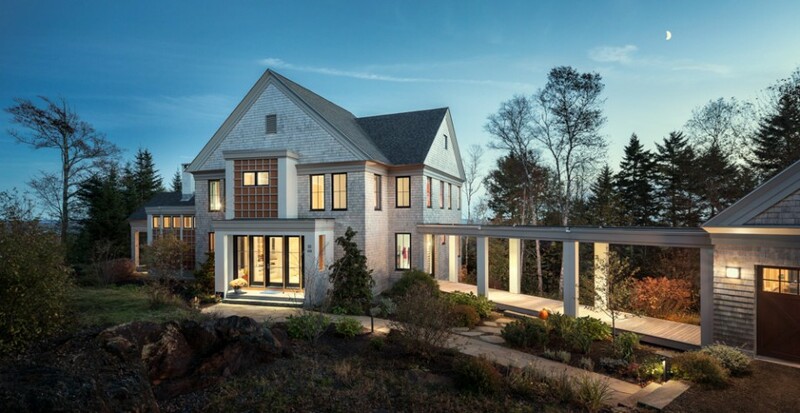 Smith engineered a novel combination solar and geothermal system, which now powers, heats, and cools more than 16,000 square feet of interior space stretched over the main house, two rental properties, and multiple garages. Unconventional building materials—like cement shingles on the exterior façade— were used to increase overall structural sustainability. 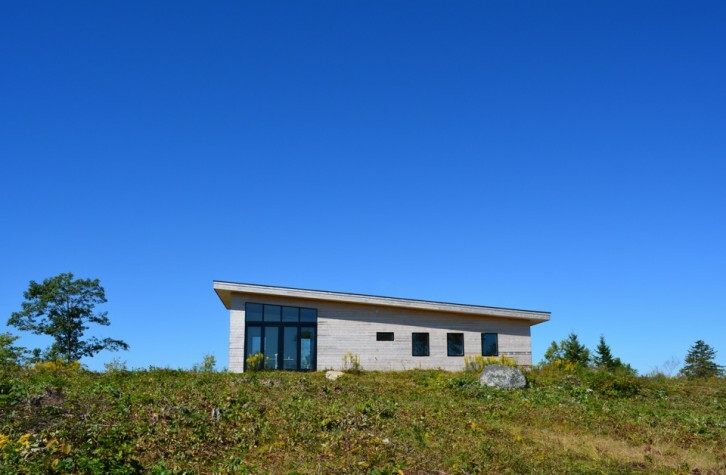 The challenges of the exposed coastal site, as well as Smith’s desire to push the envelope of green construction practices, have resulted in a real example of contemporary Maine home and design. 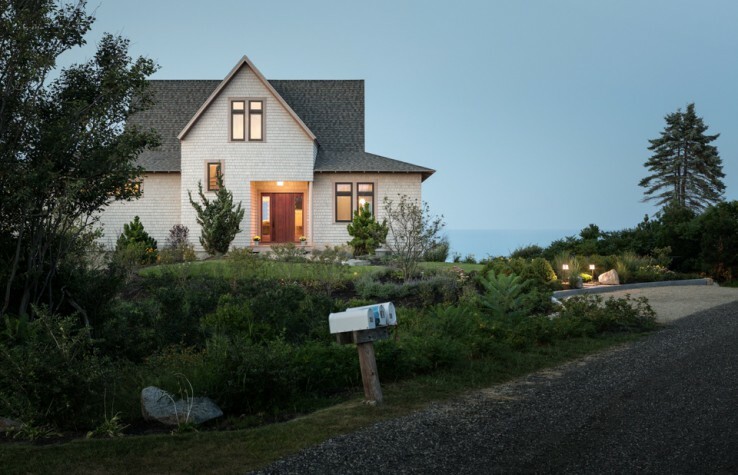 (9) A Floorplan that Echoes the Shoreline Below: This coastal retreat, located at the end of a peninsula in Boothbay Harbor, had long been in the homeowners’ family, but the existing ranch-style home never seemed to quite fit its context. Located just steps from the surf and rocks, the home felt perilously close to the water, and was noncompliant with current shoreland-zoning setbacks. Whitten Architects came up with a design solution that oriented the new home as far back from the water as possible without disrupting a well-established stand of trees. The more protected siting elevated the cottage higher on the property and placed it farther from the occasionally rough seas below. In planning the interior living space of this small home, Whitten Architects wrapped the kitchen, dining, and living spaces into an L-shape that matches a subtle bend in the shoreline below. This intentional arrangement affords panoramic views out to the ocean and islands beyond. The kitchen faces east for morning sun, and includes a comfortable breakfast nook that’s perfect for coffee at sunrise and reading the local news. At the end of the L, a cozy wood-burning fireplace serves as a backdrop to the living room. To the south, a covered porch directly connects the main living spaces to the outdoors and offers an elevated perch for watching the frequently passing lobster boats. At the top of the centrally located stair, a gallery of large awning windows serves double duty, bringing light into the middle of the house and providing natural stack-effect cooling on hot summer days. The upper- floor owners’ bedroom opens onto a private outdoor balcony, elegantly tucked into the porch roof below. Sized just right for two, the space offers a superb location to end the day overlooking vividly colorful sunsets. (10) A Modern Interpretation of a New England Farmhouse: Located on Great Cranberry Island, this project by Elliott and Elliott Architecture began as a renovation. Initially, the owners hoped that an existing building on their property could be rehabilitated: a structure that accompanied the 100-year-old farmhouse that has been their summer home for close to 40 years. The small asphalt-shingle-clad building had been uninhabited and neglected for decades, and was in a state of disrepair. A new structure would more easily meet the owners’ needs but would need to remain rooted in the traditional style of the region. To accommodate multiple generations of the family, the main farmhouse would be given over completely to the young parents and children, and the new house would become the more private space for the matriarch. The new house would be small and efficient, but comfortable enough for year-round use, a quality that the old farmhouse, with its electric heat and poor insulation, lacked. The team at Elliott and Elliott Architecture designed a modern interpretation of New England farm vernacular that establishes a hierarchical relationship between the prominent white clapboard farmhouse and the less adorned, shingled outbuildings. Between the two buildings a common area of outdoorlawn spaces and decks was created, alongwithascreenedporchthatserves as a gathering/dining area at times, while doubling as a privacy screen. Siting balanced the creation of outdoor space with the embedding of the house within the rural island fabric of the neighborhood. An ancient public walking path to the shore runs through the middle of the yard. Used by the islanders for many years, it is an important part of local tradition, and the owners were adamant that it be maintained. 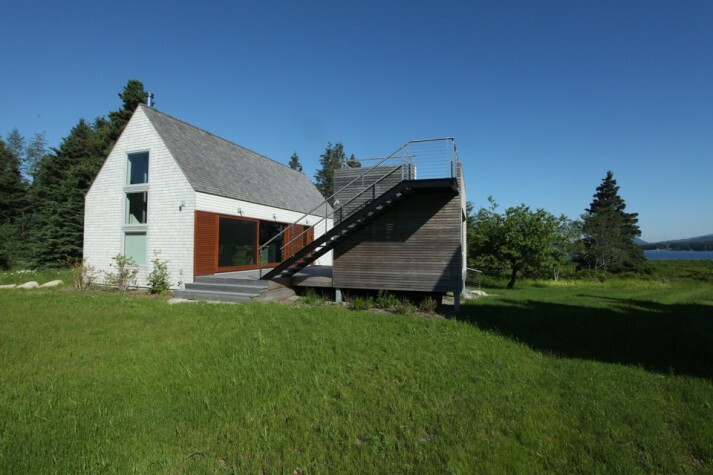 The path provides a separation between the main house and new cottage while acting as an organizing element for an already constrained site. 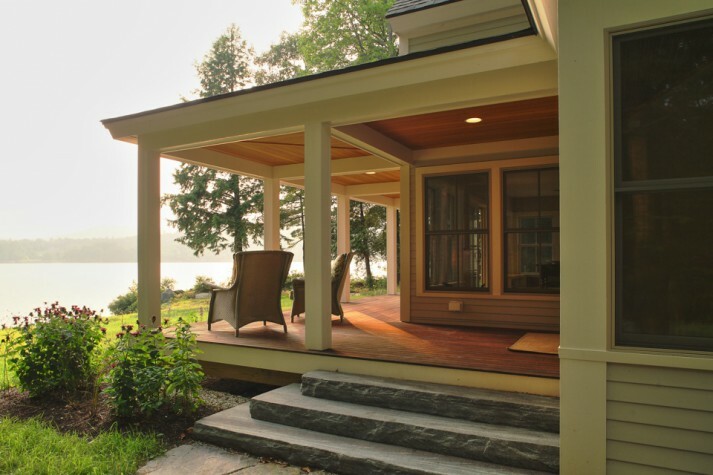 One enters the cottage via a deck that unites the new house with a screened porch. A utility block containing entry, bath, and kitchen elements subdivides the house into public and private spaces. The open living/kitchen space fronts the deck, and a bedroom overlooks the spruce forest and ocean beyond, providing respite after busy summer days. (11) A Coastal Estate for Contemporary Living: Architect John Cole’s design of this coastal compound on the midcoast started with a master plan, laying out a long-term vision that could be built over time. Attached to the area after 14 summers of renting, the homeowners bought five acres of riverfront meadow to build a place of their own for family vacations and eventual year-round residence. The master plan set Grey Havens, the main house, just back from the brow of a gentle slope to the water and a guesthouse downhill and perpendicular to preserve views and privacy. The compound harkens back to nineteenth-century coastal estates but accommodates year-round contemporary living. The south-facing end of the wide porch is framed with heavy timber, but the roof sheathing is omitted so winter sun can brighten the interior. Oversized windows and cozy bays provide all of the main living spaces with panoramic views. (12) A Net-Zero Retreat with Stunning Views: After camping for almost a decade on a secluded perch on the site of a former granite quarry with stunning views of the Blue Hill peninsula, the owners were ready to build their home on the quiet spot they had explored. They wanted a house that touched the site respectfully while being comfortable and durable and producing more energy than it consumed. Kaplan Thompson Architects designed a single-story home that floats on piers along the ledge outcroppings, allowing each room its own unique view of the bay and letting the site’s natural drainage pattern remain. Two distinct bedroom suites are separated by the primary living space, which is rotated to face directly south for maximal solar gain and to provide dynamic vistas across Blue Hill Bay. The main living space expands into a lofty cathedral ceiling with exposed collar ties, finishes, and millwork composed of locally milled fir boards. Deep roof eaves give the house an intimate scale and block high summer sun while still allowing lower winter sunshine to penetrate into each room. Twelve-inch-thick double-stud walls, 14” in- sulated floor framing, 16” insulated roof framing, and triple-glazed windows all combine to provide a high-performance R40 to R75 thermal enve- lope around the entire house. Designed to achieve net-zero energy consumption, this house needs no more than a few small lengths of electric-resistance baseboard to heat it, even on the coldest days of winter. A 6-kilowatt solar PV array offsets all the electricity demand. A woodstove provides backup heat and ambience, while a solar thermal system provides all hot water. (13) A Patchwork Quilt of Old and New: For years, the one-day owners of this house on Kittery Point had watched the property as the original house fell into a state of disuse and disrepair. When the opportunity to purchase it came, they seized the chance to restore the historic property. The process of renovating and reworking the old structure into a contemporary home was complicated by its state of disrepair and, paradoxically, by the richness and complexity of its history. The owners wanted to preserve as much of that history as possible, but the extensive changes the house had undergone, including multiple stages of deconstruction and rebuilding, defied any simple understanding of what restoration would mean. When a simple restoration did not seem possible, the owners, working alongside ARQ Architects, decided to undertake what previous generations of owners had done: to save and reuse the best of the old and adapt it to the new conditions of contemporary life. Like a patchwork quilt assembled out of fragments of discarded cloth, the new home repurposes the old pieces to create an entirely new whole that honors and celebrates the parts from which it was constructed. ARQ designed a new addition to the rear of the home that includes spaces for functions that the owners could not accommodate in the existing house. 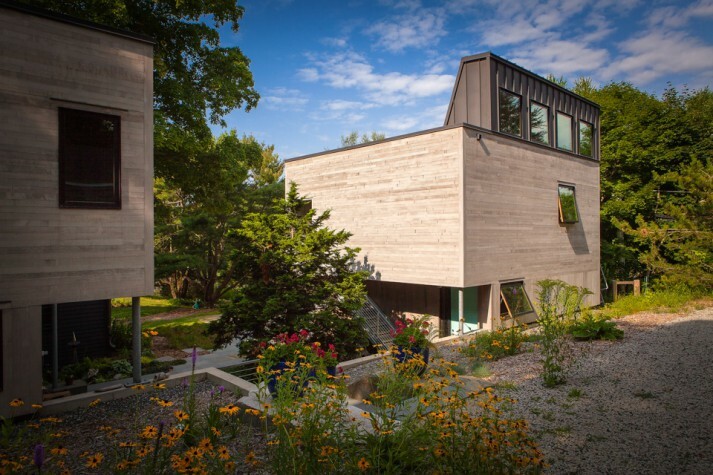 Paired with a separate studio and garage building, the addition uses a modern construction vocabulary of simple volumes and unadorned materials that roots it in the contemporary world while echoing the straightforward, unpretentious sensibility that has characterized New England architecture since colonial times. 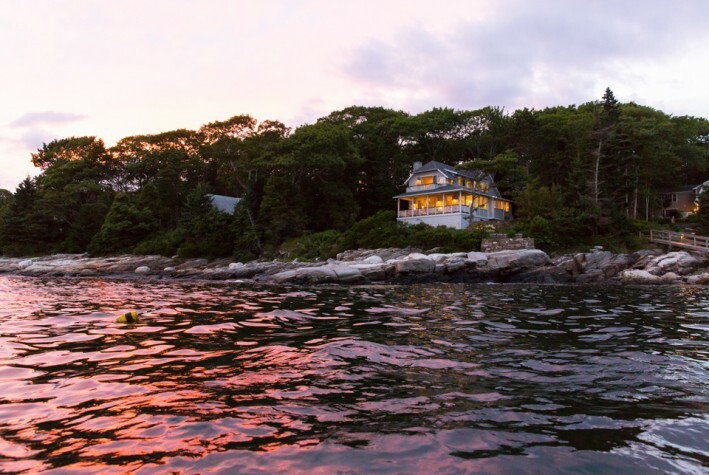 (14) Optimizing Energy Efficiency in the Cottage Vernacular: In converting a Y-shaped, 1,800-square-foot, single-story seasonal cottage on Casco Bay into a two-bedroom year-round residence, GO Logic opted to maximize renewable energy resources, sunlight, views, and comfort. Operating under the strict zoning constraints, the 30 percent expansion allowance was used to improve the building shell, optimizing the home’s energy efficiency with highly insulated walls and ceiling. 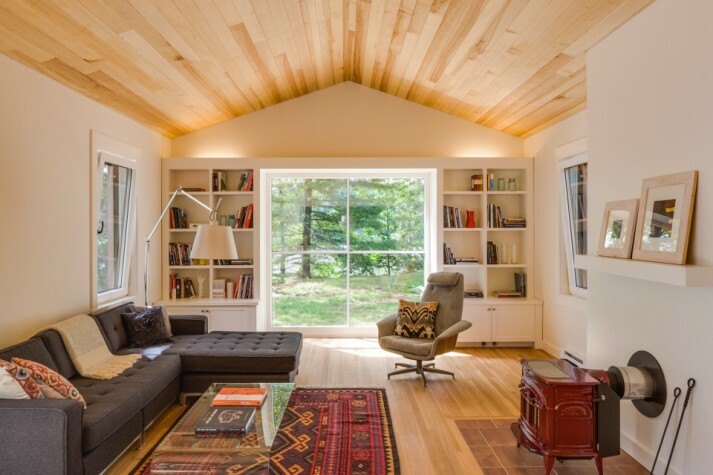 Passive solar heat was captured by adding large south-facing windows in the living room and entry rooms, along with a thermal mass wall. Floor-to-ceiling windows with retractable shades on the east façade maximize captivating views of the bay, a surrounding meadow, and a stand of mature hardwood trees that remained untouched in the demolition and reconstruction process, as the client had requested. Couched in the local cottage vernacular, the interior materials palette consists of white built-in cabinetry and a clear finish on the white oak flooring and ash ceiling. 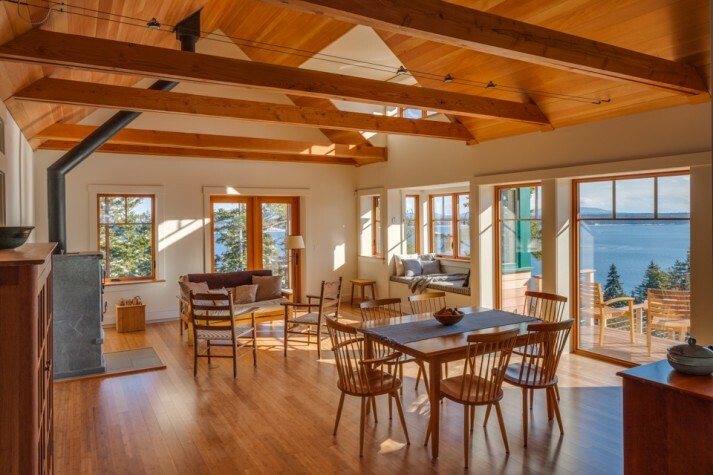 Such simple interior design emphasizes the sweeping bay views. The exterior—unfinished eastern white cedar shakes, western red cedar boards and rafter tails, and a painted standing-seam metal roof—recalls traditional Maine coastal architecture. The façade will weather to a silvery gray over time, blending in seamlessly with its surroundings. (15) Energy-Efficient on a Sliver of Buildable Terrain: A young couple describing themselves as “two plus dogs” requested a home with a spacious kitchen and an aesthetic that combines modern and traditional. Chosen for its spectacular coastal view, their site in Northport presented just a sliver of level buildable terrain between bold ledge and steep slope. Architects John Priestley and Richard Bernhard of Bernhard and Priestley Architecture (now Priestley and Associates) designed a plan organized around a central kitchen positioned for commanding views that supports both culinary and entertaining uses. To naturally fit with the land, the main axis of the house aligns with topography: skewed terrace, deck, and balcony elements induce an orientation sympathetic to the off-axis viewscape and rotate the entrance favorably to welcome visitors. Interplays between traditional and modern expressions are reinforced by exterior details. Classically proportioned windows are pared down to a spare muntin layout; exterior casings are eliminated in favor of crisp shingle returns; eaves are knife-edge, with frieze and cornice abstracted to taut bands. Over-scale grids float above smooth panel siding, allowing climbing greenery. In the entry, an opening above shelves frames the view through the dining room to the living room fireplace, and a glimpse of kitchen appears down a corridor, making all living areas intriguingly revealed upon entry. The design affords visual connectedness and distributed natural light while creating formally defined spaces. Vegetated roofs cover the living room, breezeway, and entry. Passive solar was achieved via limited north fenestration and broad expanses of glazing on the south side. The building’s compact, cube-like overall form yields a favorable volume-to-skin ratio. Energy Star appliances, dual- flush toilets, renewable materials, and high-efficiency lighting all contribute to sustainability. 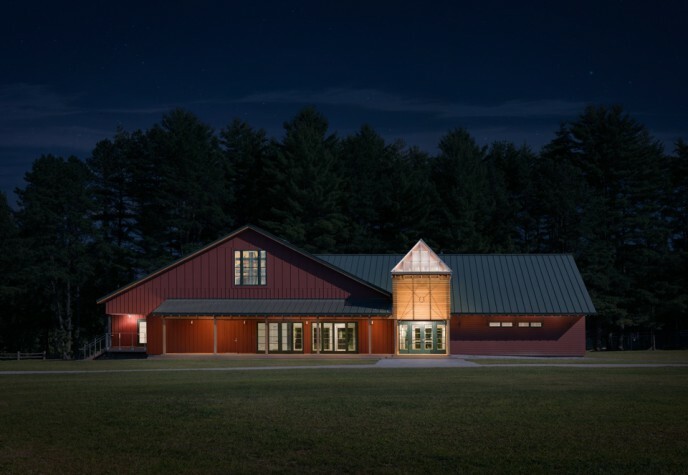 (16) A Performance Space Honors the Camp Vernacular: Camp Sebago is a summer camp for children on Sebago Lake. The picturesque camp is a collection of wooden buildings, all painted red with green roofs, following the shoreline and wooded edge of a large central clearing. Reminded of some of the early buildings designed by John Calvin Stevens (a founder of SMRT), Paul Lewandowski and his SMRT project team of Nicole Rogers, Tim McDonald, and Paul Stevens (the great-grandson of John Calvin Stevens) looked through the Maine Historical Society’s photo collection and were inspired by the vernacular camparchitecture. Sebago Hall contains a 350-seat performance space,classroom, restrooms, outdoor decks, and stone plazas. The building is entered through a tower with wooden slats, a translucent roof that glows at night, and a steel bracing system that loosely resembles the collection bucket that funds the Salvation Army’s work. Inside the building, a cut-maple-panel ceiling filters LED lighting to make shadows on the floor, mimicking the experience of traveling down the sun-dappled camp road. To evoke the spirit of camp, interior designer Jeana Richard had crescent moons cut into the bathroom doors and used a porcelain floor tile that simulates a distressed wooden floor but is easy to maintain. The red concrete sinks are by Beachstone Sustainable Surfaces in Portland. Structural engineer Andrew Bradley designed the three-dimensional truss of wood and steel to support the roof of the performance space. The modular structure needed to be able to be transported to the site on camp roads. To light the hall, three LED utility- light “chandeliers,” designed by SMRT with Zachau Construction and B.H. Milliken, give the effect of a jar of fireflies on a summer night. (17) Simple & Scaled to Fit: Architect Bruce Butler of By Design designed this Lake Anasagunticook home for year-round, one-level living, with two upstairs bedrooms and baths and a shared deck that overlooks the water. The house had to fit within a restrictive zoning envelope and be no larger than the combined square footage of the dilapidated camp and trailer home that were removed from the site. Butler designed the main level with an open, informal plan, with kitchen, dining, and living rooms focused westward toward the lake. A wood-burning fireplace provides additional wintertime warmth, a three-season room located south of the living room is ideal for warm summer evenings, and a wraparound porch extends the living space toward the water. The walls and roof are air-sealed and heavily insulated, and heating and cooling are provided by a ground-source heat-pump system. Low- maintenance exterior materials, such as cement-fiber clapboards and fiberglass windows, were used, and the landscaping features native plantings and stone to create walkways, terraces, and informal planting beds. Local cabinetmakers built the custom cabinets in the kitchen, pantry, and bathrooms. White-painted wainscot and maple floors are used throughout the main level to keep the interior bright. The form of the house is simple and scaled to fit in with the neighboring camps. (18) In Harmony with Nature: In collaboration with the homeowner—a sound artist who works predominately with nature sounds—architects Will Winkelman and Eric Sokol of Winkelman Architecture designed a building program for a modest two-bedroom year-round residence of 1,700 square feet with a detached 900-square-foot art studio and a one-car garage. The site is a 15-acre former homestead in downeast Maine that is beachfront on a bay with sweepingsoutherly views to Petit Manan Lighthouse. The design process was a highly collaborative series of on-site“charrettes” that included the client and landscape architect. The result was a set of three modest buildings (of which the house and studio have been built, with a future detached garage planned)designed to knit into the landscape, not dominate it. The buildings organize as one, together defining a central naturalized courtyard that opens to the view and the field that rolls away to the south. Circulation axes and sight lines stitch the buildings together, bridging the landscaped middle. While these axes are defined and framed by building edges and pathways, they always lead and focus through to the landscape and daylight, creating a deliberate tie back to nature and blurring the edges between the built and the natural. The building exceeds its net-zero energy-consumption goal using a grid-tied ground-mounted photovoltaic array that powers geothermal heat pumps for radiant in-floor heat, high-efficiencyappliances, and LED lighting. The buildings are superinsulated, with close attention paid to detailing to minimize thermal bridging and maintain an extremely airtight envelope. Triple-glazed, high- performance doors and windows are sized and located to maximize passive solar gain and to minimize heat loss. Passive ventilation provides cooling. The house consists of environmentally friendly, sustainable, recycled, and locally sourced materials wherever possible, including low-VOC materials.